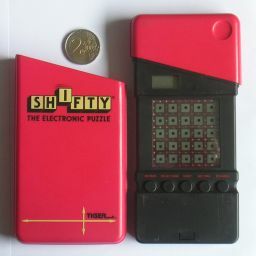 Shifty is an electronic puzzle by Tiger Electronics from 1988. It has an LED display that shows a 5×5 grid of squares, and which is also touch-sensitive so that you can press any of the squares. There is also a separate numerical display that shows the number of moves performed. The 5×5 board should be considered two-sided, with only the front normally being shown. At the start all the squares on the front are white, and all the squares on the unseen back of the board are black. A move consists of shifting a row horizontally or a column vertically in either direction. The squares that shift off one side of the board appear on that side of the hidden back of the board, and vice versa. It is as if the 10 squares involved form a loop wrapped around the board. There is a button (SEE THRU) that you can press that makes the screen display the hidden side of the board, as if you could see through the front to the layer underneath. A move is performed by pressing a square (making it blink) and then pressing its destination. In this way you can shift a row or column by up to 4 places in a single move. There are 25 built-in puzzles. The first 10 puzzles have a pattern that you are supposed to match on the front of the board (the back is allowed to be anything). In the next 10 puzzles patterns for both the front and back are given, and they are negative images of each other (i.e. black and white swapped). In the last 5 puzzles the goal patterns for front and back have no relation. To select a puzzle, hold down the SELECT/VIEW button and press one of the squares of the board. If you press the SELECT/VIEW button during play it displays the goal patterns. Finally it is also possible to play a random game. Random moves are performed when you keep down the SCRAMBLE button. In this case the aim is to restore it to the start position (front all white, back all black). ON/MUTE: Switches the Shifty on. It switches off automatically after 3 minutes of no activity. ON/MUTE: Mutes or unmutes the sounds. SELECT/VIEW: If held down and then a square on the board is pressed, then the built-in puzzle corresponding to that board square is selected. SELECT/VIEW: Pressing this during play will show the goal pattern, first the front then (unless it is one of the first 10 puzzles) also the back. The move count display shows the length of the best solution so far (or 0 if it has not yet been solved). START: Start or re-start the selected puzzle. The move counter is reset to zero and the board is returned to the start position. SEE THRU: Show the squares on the back of the board, as if you were looking directly through the top layer to the back. SCRAMBLE: Randomly mix the puzzle. In this case the goal is to return to the start position (white on the front, black on the back). There are 50 squares on the board (5×5 on both sides) and half of them are black and half of them are white. This gives 50! / 25!2 = 126,410,606,437,752 possible positions. All of these are achievable. Number the rows 1 to 5 from top to bottom, and label the columns from left to right with the letters A to E. The directions Up, Down, Left, and Right will be denoted by the letters u, d, l, r. Any move can then be denoted by the row or column letter, a direction letter, and a number indicating the distance moved. For example 3r2 means moving the middle row two squares to the right. Sometimes a distance of 5 is used, and in practice that has to be done in two moves. If x is any of the three middle rows, then the 3-cycle of pieces shown in the picture on the right can be achieved by doing the move sequence Eu1 xr2 Ed1 xr1 Eu1 xl1 Ed1 xl2 twice. With this move sequence it becomes easy, if tedious, to solve any position. Not all of these solutions are optimal, so let me know if you find better ones.